Steamy New York weekends call for easy crop tops and high waisted shorts. 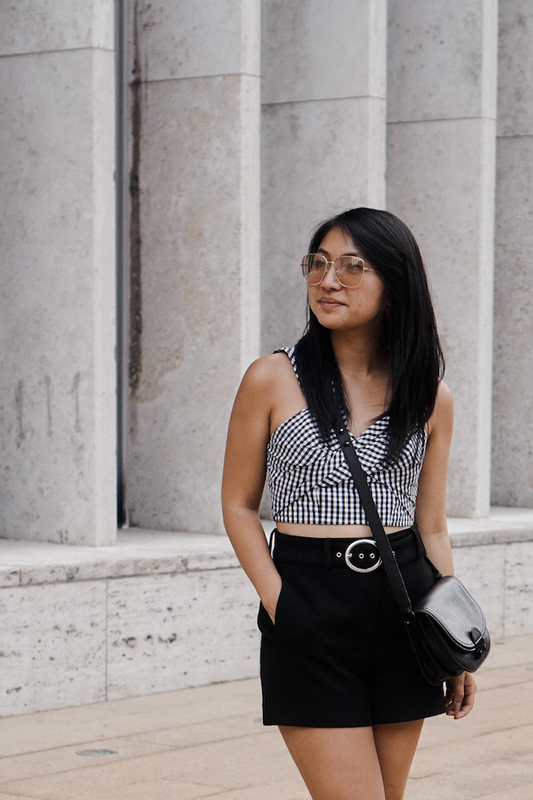 Plus, a good bustier design is also an excuse to go braless in the heat, am I right? Recent date night plans had me feeling girly with this ruffled skirt and off-shoulder top combination. I'm all about a seamless desk-to-dinner outfit. The top and the skirts in the gingham ! I'm so obsessed with gingham lately so I couldn't agree more with your 2 different outfits ! Love both looks but the second is my Fav. Love the looks! Love that first skirt, how cute. Love your gingham pieces and how beautifully they're styled. <333 such incredible summer outfit! Gingham looks amazing on you! Loved how you styled both pieces. Gingham is such an amazing print. I love both of your looks, Christina. That ruffle skirt is so pretty. Gingham is all around right now and you wear it nicely! I think you could also wear the two gingham pieces together, for an edgy look! Love love love the first look! Soo chic and effortless! Perfect outfit!! Love the top, that is so gorgeous. isn't it? I love gingham and you look sooo good in both of the outfits, I am loving this post.